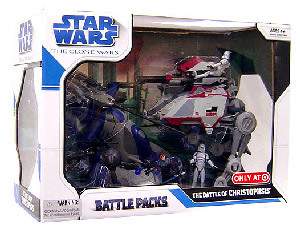 Description Of Item: Clone troopers & battle droids clash on the streets of Crystal City. Anakin Skywalker leads a squad of clone troopers against Separatist forces on the remote planet of Christophsis.. Weapon fire blasts the roadways & shatters the crystalline buildings, as each side looks for a weakness in his opponent's line of defense. AAT's rumble through the smoke-filled city under fire from Republic heavy artillery, and clone troopers mounted on mobile AT-AP's stride forward to meet them head on/ Explosions erupt throughout the city, an all-too familiar sound of battle being echoed on planets throughout the war-torn galaxy.